Arriving at Okayama station just before lunchtime, Bama and I are struck by the sheer volume of people passing through. Most lug a small suitcase for the long weekend; gaggles of students in uniform – the navy blue and white outfits we’ve seen in all those anime cartoons – throng the tiled corridor leading down to an outdoor plaza; suited-up businessmen and families with strollers crisscross our path. The unexpected aroma of Belgian waffles, freshly made on the griddle, wafts into our nostrils from a brightly lit stall. Turning right through a pair of sliding glass doors, we see gift boxes immaculately arranged by colour on the shelves of a department store, people lining up for lunch at a sushi bar, and a chain restaurant specialising in tonkatsu, the breaded and deep-fried pork cutlet perfected to an art by the Japanese. 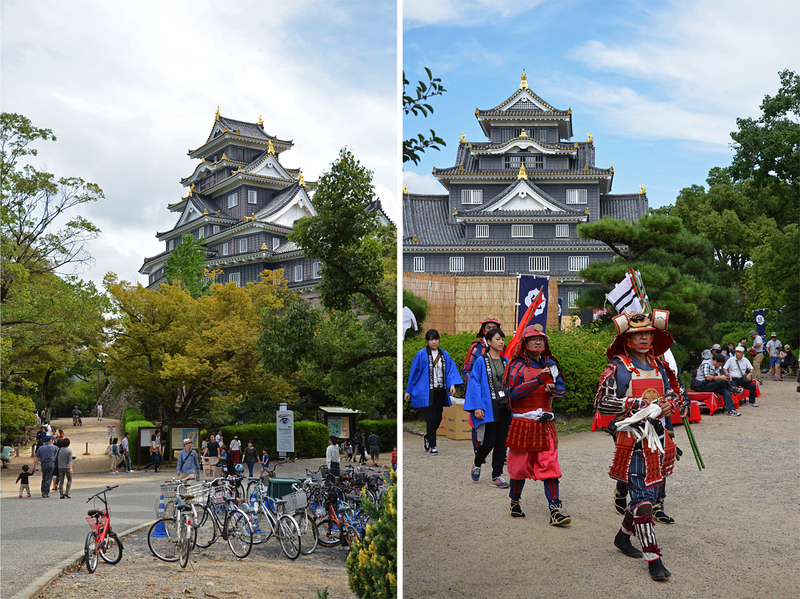 Okayama is a city of 700,000 people, but on this first encounter, it feels much, much bigger. We find the area beyond the station a portrait of efficiency, with a vast underground concourse lined with boutiques and restaurants spreading its tendrils below the nearby avenues; a second-floor walkway to a four-star hotel; and convenience stores offering all manner of bottled drinks, seasonally themed desserts, and restaurant-grade microwave meals. 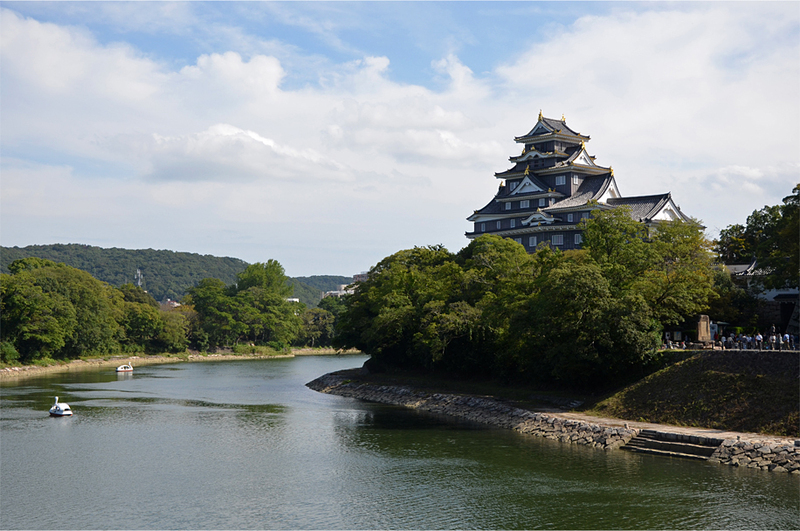 Of course, we have not come to Okayama to see all the trappings of modern life. Bama and I leave our bags at the hotel, before hopping aboard a tram to the riverside “Crow Castle”, a faithful reconstruction from 1966. 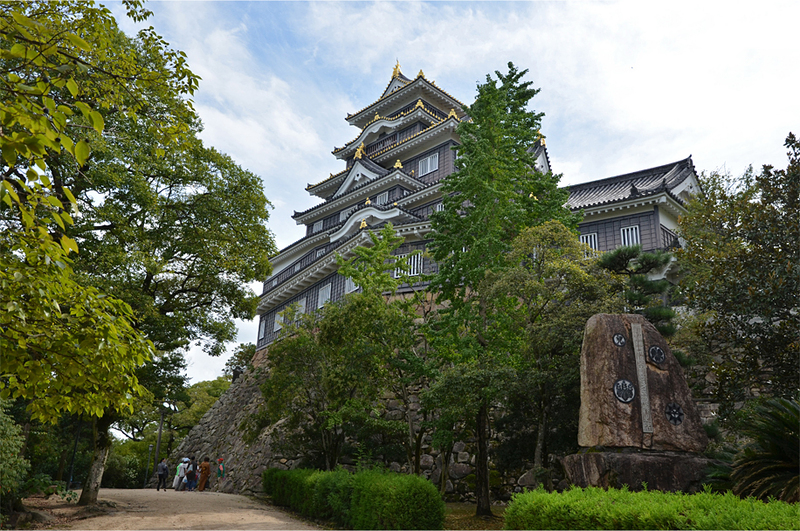 The wooden original, along with much of Okayama itself, succumbed to a bombing raid in the final months of World War II. 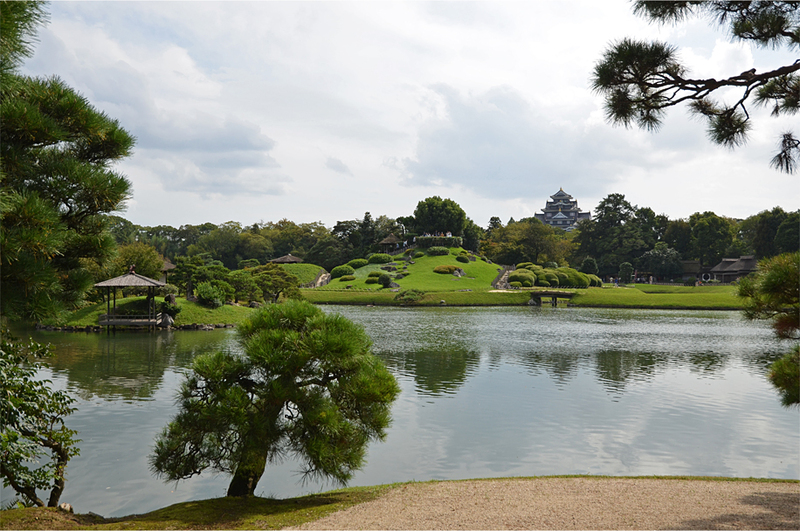 But the nearby pleasure garden of Korakuen was luckier. 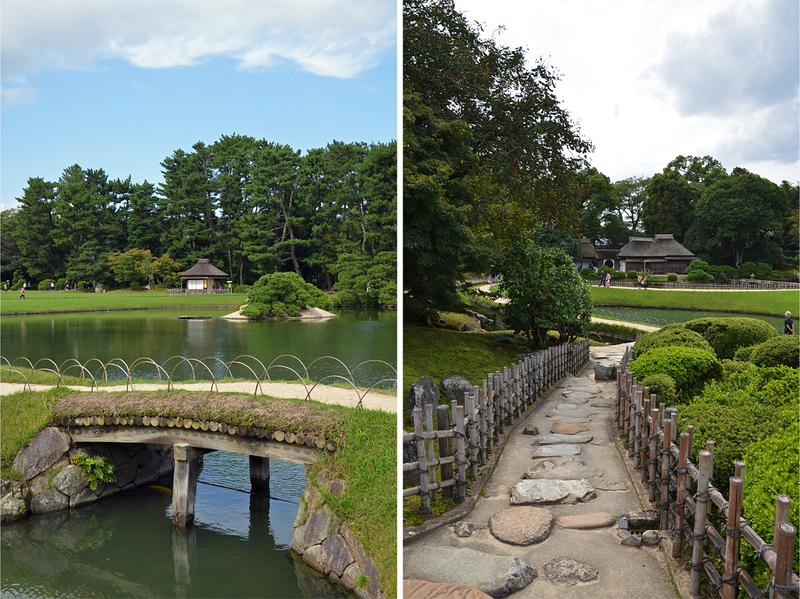 Protected by the width of the Asahi River, and its position on the city’s then-outskirts, the late 17th-century creation escaped the war with far less damage. 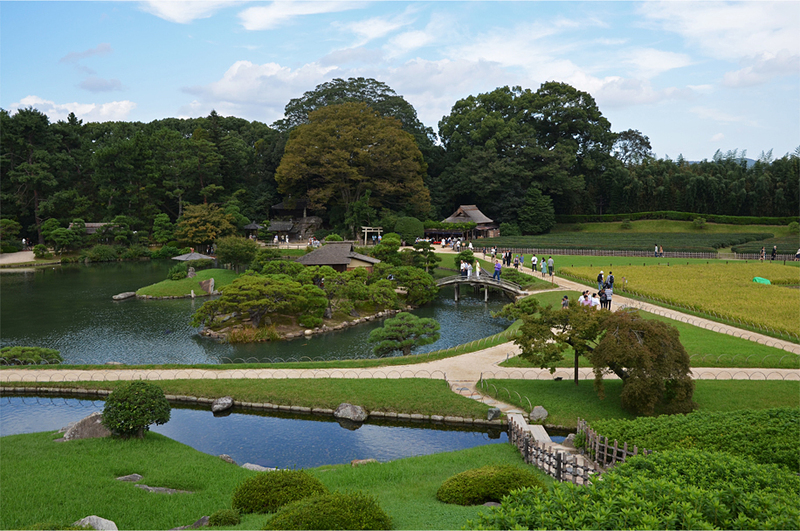 The brainchild of feudal lord Ikeda Tsunamasa, who oversaw its construction over a span of 14 years, Korakuen is widely considered one of Japan’s three greatest traditional gardens. In a country where even the tiniest moss-covered yard is a thing of beauty, that’s quite the accolade. 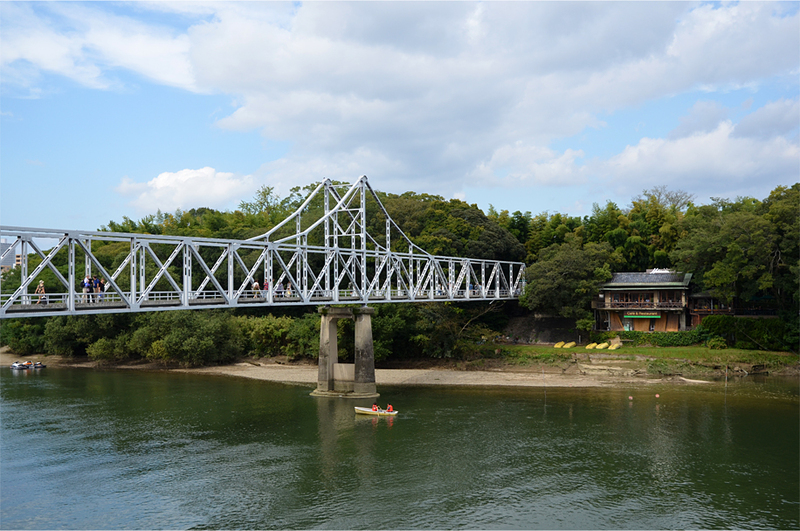 From the castle grounds, a steel footbridge spans the placid waters of the Asahi, disappearing on the opposite bank into the trees surrounding Korakuen. To enter the garden, it seems, is to enter another realm. 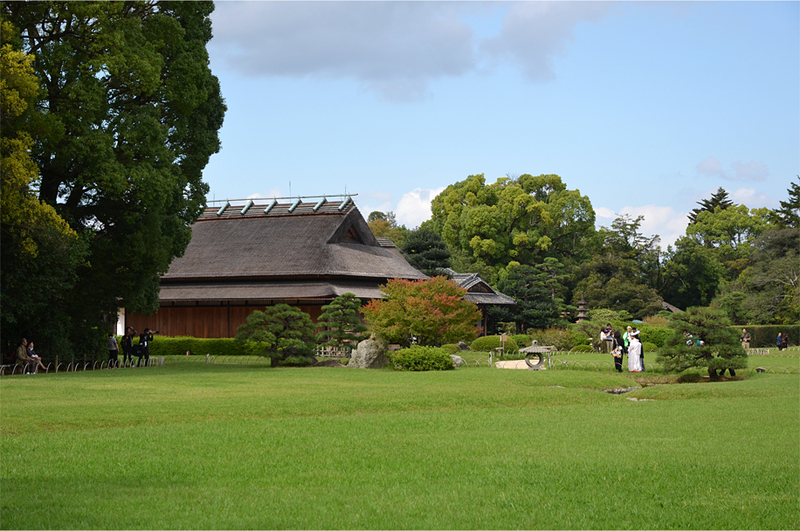 A tall thicket of bamboo droops and sways languidly in the gentle breeze, and before us a network of pathways fans out across the perfectly manicured lawns. 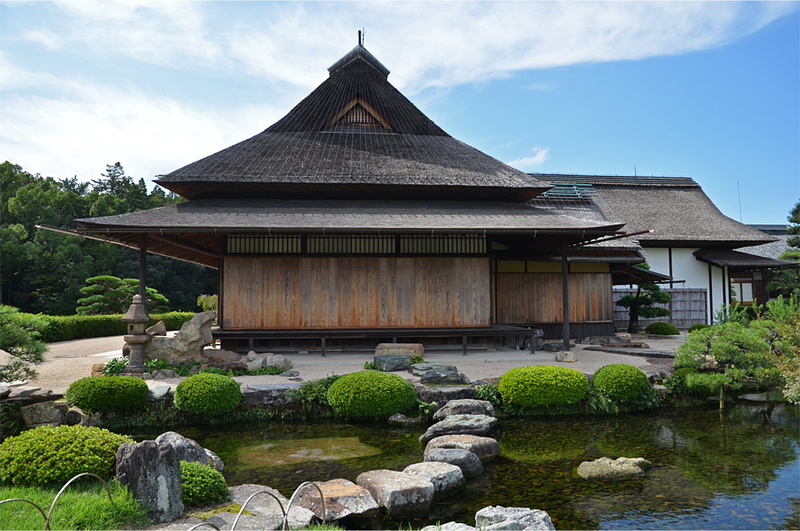 The tranquil scene is dotted with pavilions and teahouses roofed in thatch; on the far side of a central pond, which sports three miniature islands, a small temple is nearly lost below a canopy dyed with the first tinges of autumn. We follow a series of stepping stones over a stream, past a cluster of trimmed azalea bushes that suggest billowing summer clouds, and climb a small man-made hill to take in panoramic views of the garden. Off in the distance, a few wayward high-rises peek out above the trees. But the rest of what we see is decidedly bucolic, down to the neat pattern of paddy fields and a small tea plantation. I almost wish we came in spring, because that is when Korakuen’s cherry and plum groves burst into a cascade of vivid whites and pinks, followed by the azalea blooms of vibrant crimson and magenta elsewhere in the garden. But the absence of flowers does not detract from its sublime beauty. 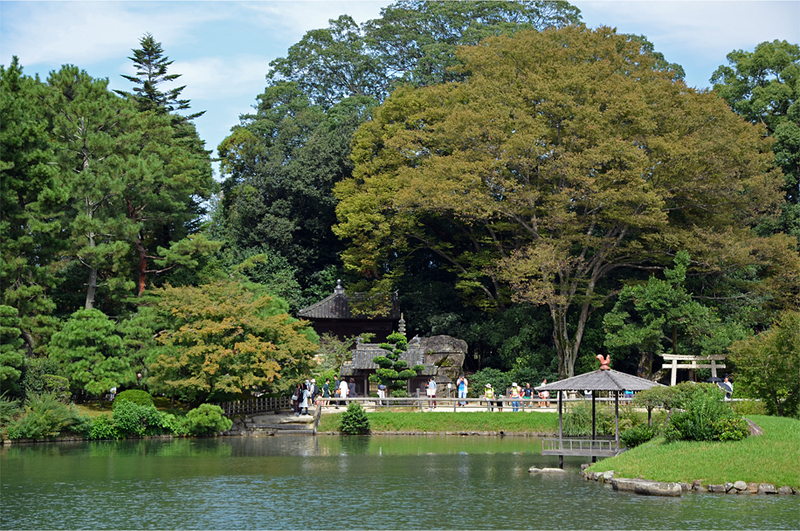 After all, Korakuen has been designed to surprise visitors with a new view at every turn, in accordance with a style known as kaiyu, or “scenic promenade”. 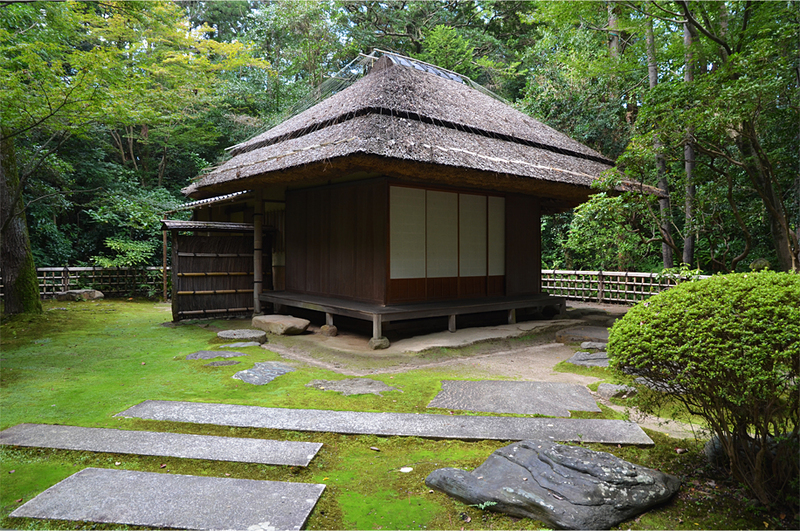 There’s even a pavilion with a stream flowing right through the middle, flanked by wooden sitting areas where visitors might contemplate the tableau of framed views, but we somehow miss it on our midday amble; what’s more, both of us are getting hungry. 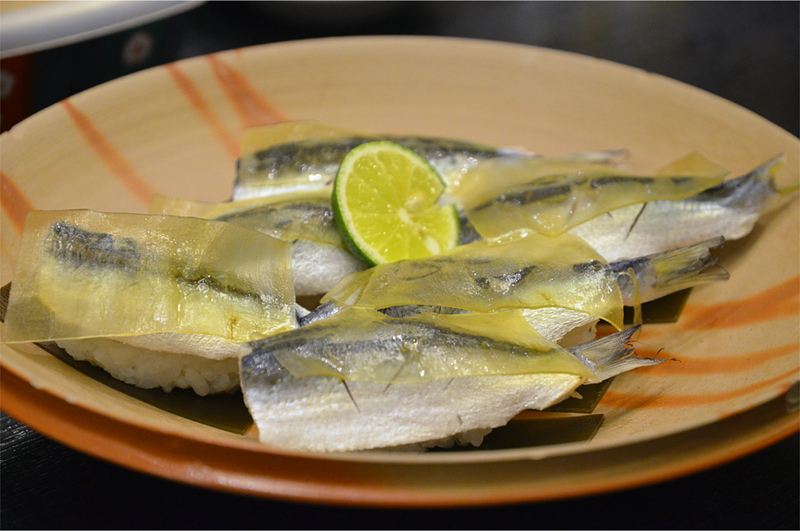 Perhaps it shouldn’t come as a surprise that Okayama has some of the tastiest food of our trip. 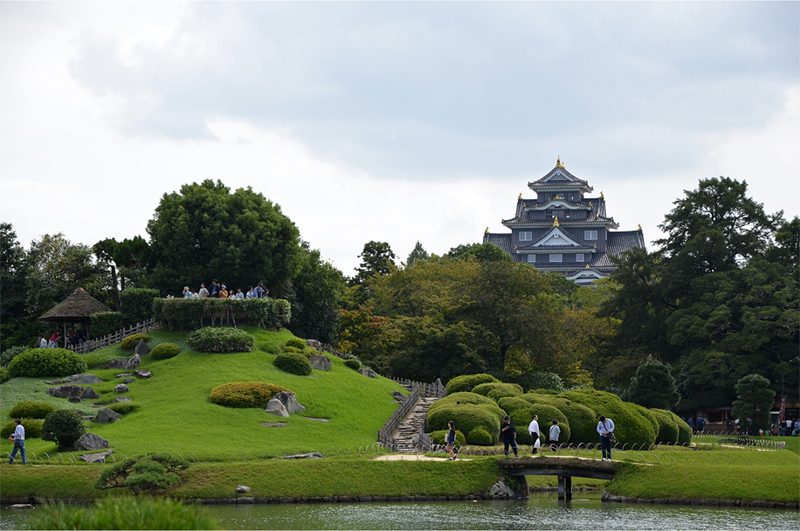 Known as Japan’s “Sunny Country”, the prefecture is blessed with a mild climate and warm conditions throughout the year. Rice, eggplant, and Chinese chives are specialties of the Okayama plain, while grapes and white peaches are cultivated in the nearby mountains. Momotaro, the mythical boy hero who descended to earth inside a giant peach, is associated with this specific region of Japan. Bama and I settle on a late lunch at a small, cozy restaurant outside the southern gateway to Korakuen. 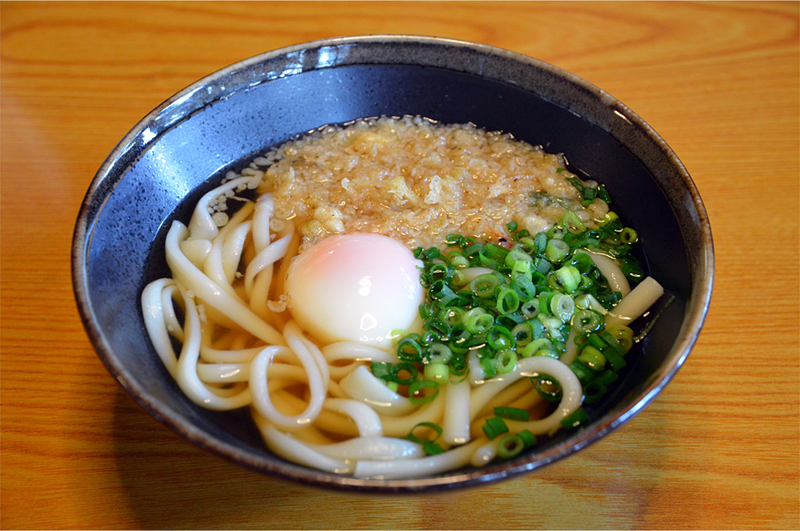 Here, we sit cross-legged on tatami mats, slurping up hand-pulled tenobe udon served with onsen egg – precisely boiled so the yolk remains runny – not to mention chopped spring onion and a cloud of fried tempura batter. 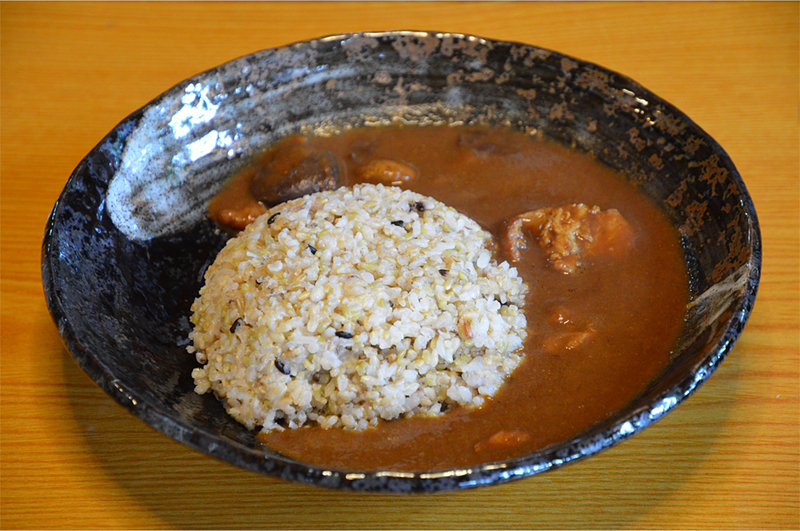 Equally delicious is the organic rice and chicken in a savory-sweet peach and grape curry. In Okayama, we relish waking up to the prospect of a hearty Japanese buffet breakfast. Down in the hotel’s brightly lit restaurant, a smiling staff member takes our meal vouchers and greets us with a bow. “Ohayo gozaimasu!” she chimes. My eyes widen when I see the buffet counters stocked with all manner of edible delights. There are delicate square bowls holding the softest tofu, to which we add a splash of soy sauce, then toppings of spring onion and bonito flakes; a counter laden with yoghurt, chopped fruit, and salad; a pile of the Okayama specialty ebimeshi, shrimp rice fried in a spiced and smoky caramel-like sauce; perfectly scrambled egg that melts in the mouth; and best of all, a Japanese curry infused with the unexpected sweetness of locally grown tomatoes. I don’t typically like tomato juice, but the one at our Okayama hotel was exceptional. At the train station’s sushi bar, Bama and I sample some freshly caught fish from the nearby Inland Sea. 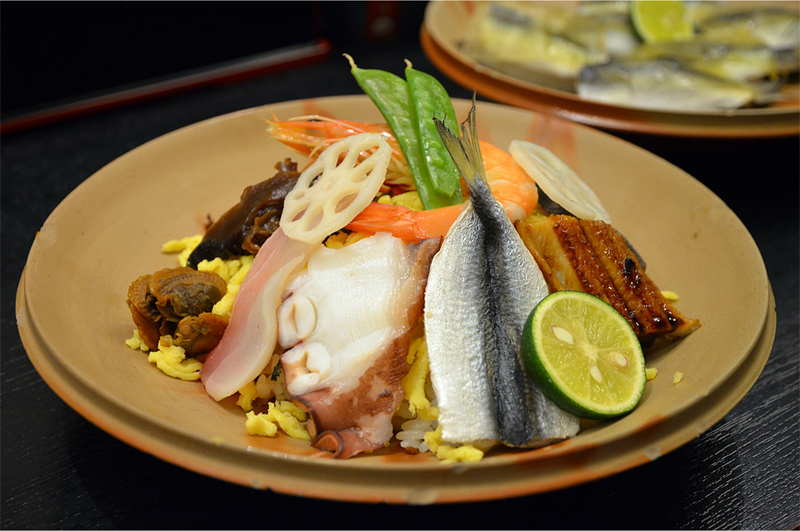 We order a plate of mamakari-zushi – pickled sardinella sushi – along with bara-zushi, an eye-catching platter of assorted sashimi, cooked seafood, and lotus root laid atop a mound of shredded egg and rice. 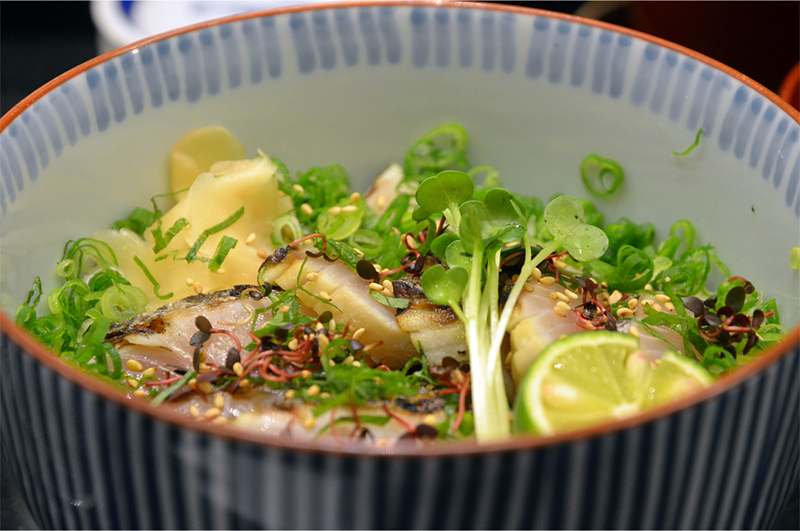 But our clear favourite is sawara-don, a sushi rice bowl topped with delicate slices of Spanish mackerel, not to mention a colorful garnish of pine nuts, alfalfa, spring onion, and pickled ginger. Okayama is said to be the only place in Japan where sawara can be reliably found in the local waters; fish markets elsewhere in the country often rely on stocks imported from Korea. Such a lovely place. I love all your shots. Thank you, Arlene. I was hoping I hadn’t gone overboard with all those garden pictures! Garden pics are always welcome. 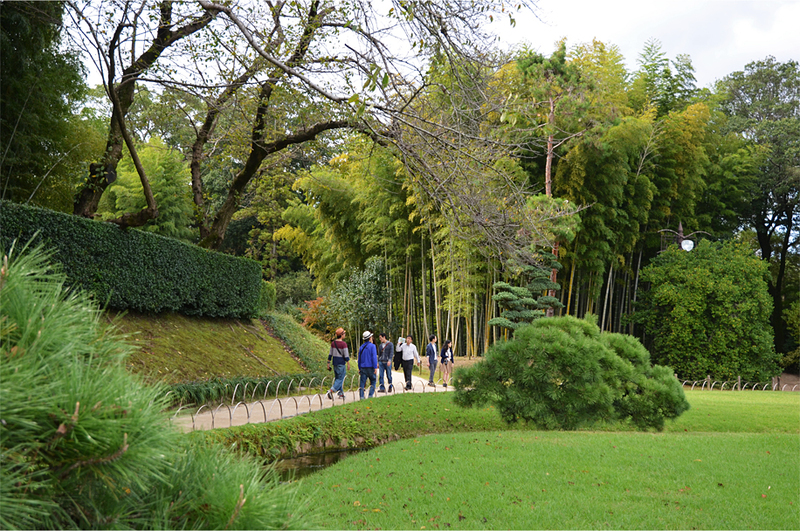 “Korakuen has been designed to surprise visitors with a new view at every turn, in accordance with a style known as kaiyu, or “scenic promenade”. – I’ve heard of this concept with designing hiking trails in the forest, having them dip in and out of the trees to offer periodic views. That food looks nice. I’ve not been to Japan, but I’ve heard again and again that all the food is high quality and cooked with care. Do you find that to be the case? Yep, I’d say food is one of the major highlights of Japan. Even in the convenience stores I found the desserts and microwave meals to be a cut above those of other countries, and as you suggested, all were made with the utmost care. Wonderful narrative and photos, James. And here i am reading this on an empty stomach with my mouth watering at the descriptions of the food! Love that mimimalism and the aspect of ordered perfection in the landscapes. So keen to read more of your insights on Japan, off to check out earlier posts. Thanks Liz! 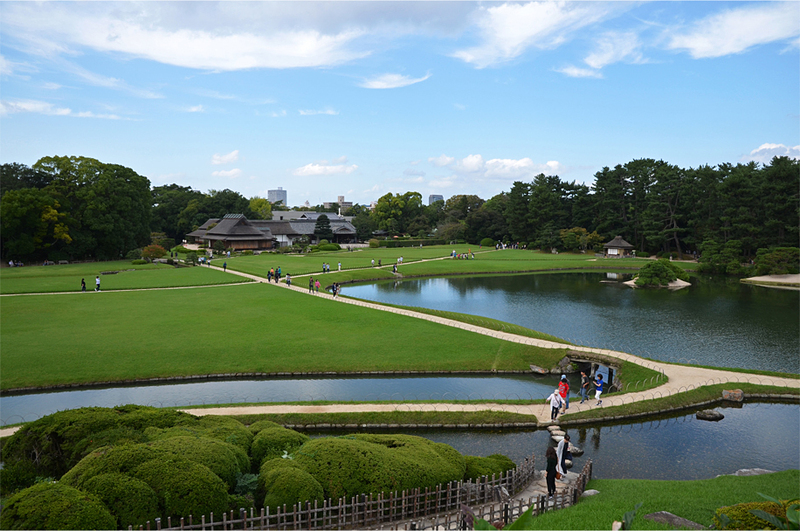 I don’t know how the Japanese manage to strike such a fine balance in designing their gardens. 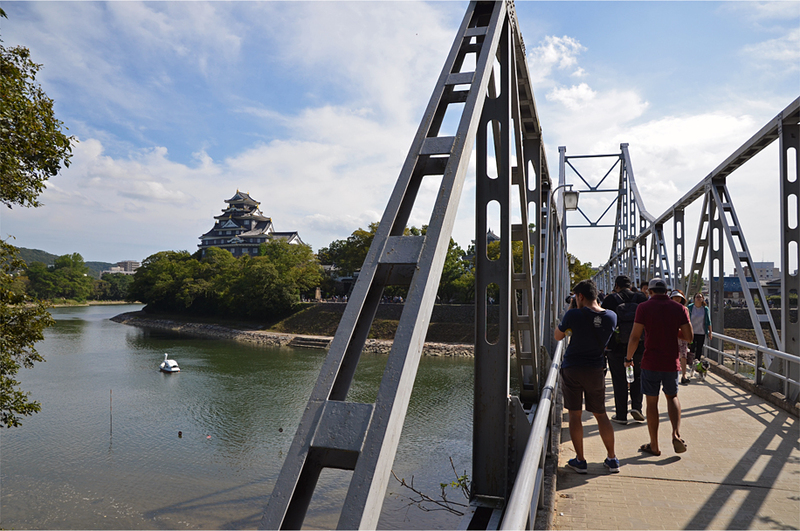 As for the food, I’m a bit surprised that Okayama isn’t more well-known internationally – we saw very few foreign visitors while we were there. 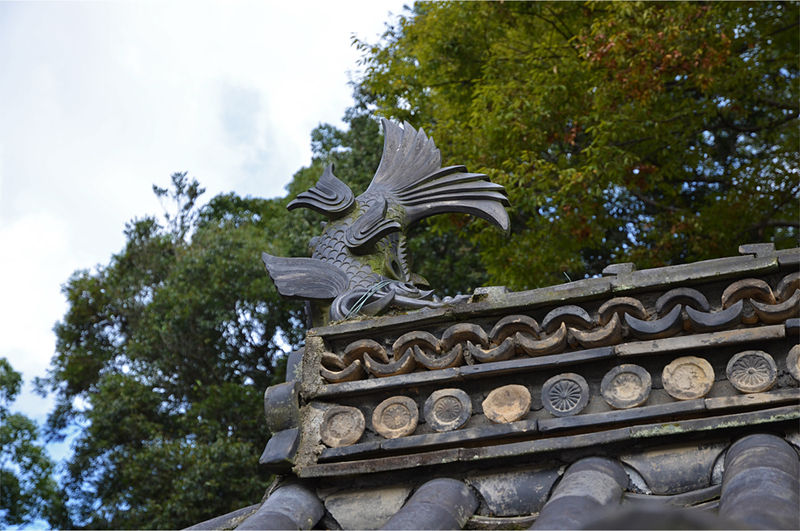 There are a few more posts in the pipeline, including one on Kyoto’s sublime temples, although I’ve been MIA (thanks to work) and pretty bad at publishing on a regular basis these days. In Indonesia I eat tomatoes just because I know they have a lot of health benefits. If only the tomatoes here were as good and sweet as the ones we had in Okayama, I would buy them more often. The fruits we had were unbelievably tasty and succulent, and honestly I don’t know for how much longer I should wait until I buy grapes again here in Jakarta. I’m glad I read this post on a (rather) full stomach! Anyway, speaking of the castle, being there amid the crowd made me realize that I wouldn’t mind having to be in the middle of a lot of people if they’re so polite and orderly like those folks in Okayama. I was really impressed how respectful and considerate everyone was. In some ways, I really think that Japan is a great role model for other Asian countries. We can all learn to be more considerate, especially out in public, and it’s something that is sorely needed in China, Indonesia, and even Hong Kong. Just imagine how much more orderly and pleasant Jakarta would be if people stopped littering, driving their motorbikes down the wrong side of the street, and doing things with an unflinching “me first” mentality! What a beautiful place. You make my mouth water for Japan – food, gardens, shining perfection, all of it. Wonderful storytelling and photographs. Thanks so much, Alison – I guess the term “shining perfection” really sums it up! 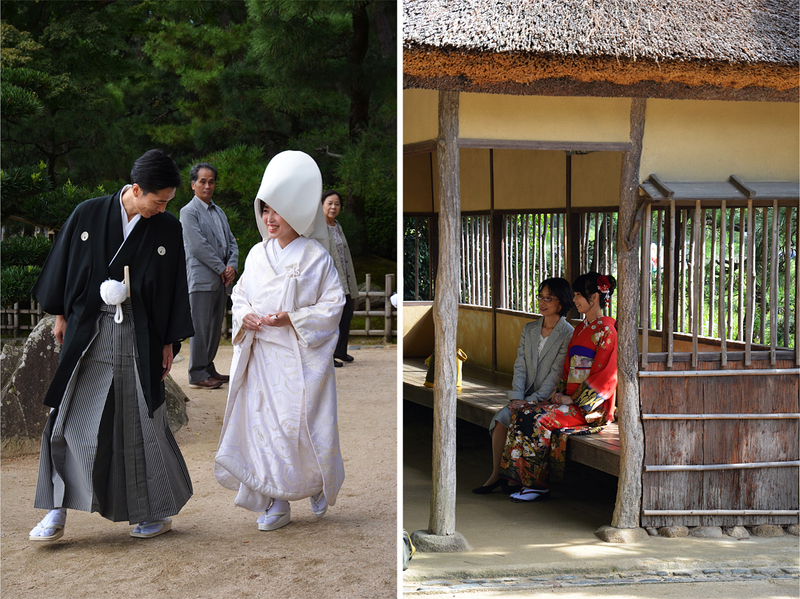 I cannot begin to describe how beautiful, efficient, and well-run Japan felt. As much as I love the madness of Indonesia, there are areas where society could do with a lot of improvement. Some of those dishes are different, James! I must admit I see modern Japanese culture and society different from Chinese culture…(what a generalizing statement). To me it’s like saying the difference between French and German traditional and current culture. Still, one day. I have to hear from a Canadian born Chinese what she thought of Japan during bike trip this years. Absolutely – I don’t think you can find those specialties in the sushi joints and upscale Japanese restaurants of Vancouver! James…very cool, and very well written, as usual. And interesting as always. I’ve been sort of out of the loop in cyberville a while, so it was nice today to get back and then find your latest post. You are like the master of photographing food, these days, I think. 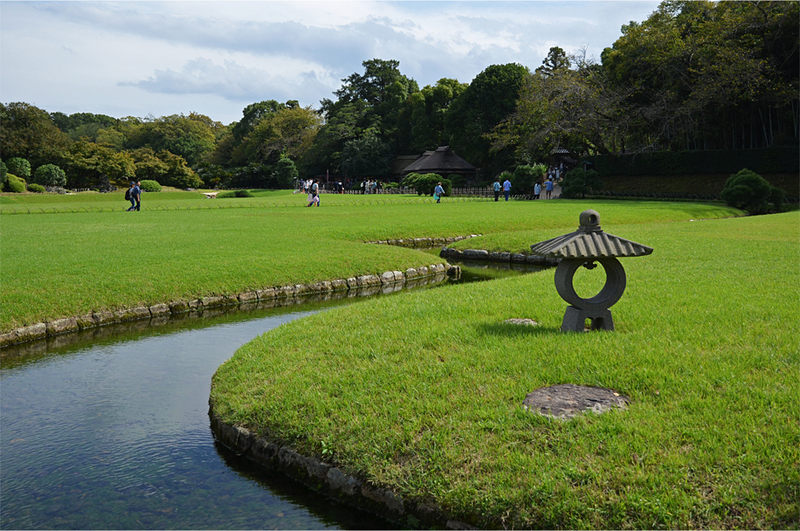 One thing the Japanese can do is a garden! Much appreciated, Badfish! It’s been the same for me the past month or so. Work-wise things are crazy hectic – I’ve barely had the time to read and comment on other blogs, much less write and publish entries on my own one. I probably mentioned this before, but I learned the art of photographing food from Bama. In fact I think he still does it better! Your descriptive writing is superb, and your expertise is backed up by great photos! I wanted to taste every one of those dishes before I even saw what they looked like. What a lush and serene place. Marilyn, you are too kind – I actually struggled to write this post for several reasons, the first one being a lack of notes from the trip. It took quite a lot of effort to get it done, choose the right photos, and finally press “publish”. Your effort was well worth if for your readers! What a serenely beautiful place! I absolutely love the architecture and color of the castle – so unique – it’s like Zen meets coastal shingle-style. I hadn’t thought of the castle’s resemblance to the coastal shingle-style until you mentioned it – but yes, there is something wonderfully rustic about that look! What a picture of paradise! Absolutely fantastic. Definitely one of my list! I forgot to add that Okayama is a very bike-friendly city. You could easily take a ride from the train station all the way to the castle and garden along a wide, tree-lined boulevard!